Ernestine Odum Jackson born June 1, 1958 in Athens TN. passed away Monday, September 3, 2018 at her residence. A native and life long resident of McMinn County, she was the daughter of the late Shirley Jean Odum. 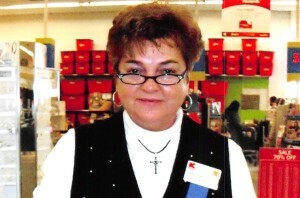 She was retired from Kmart after several years of service and was preceded in death by her husband, Bufford (BJ) Jackson (Nov 12. 2014); adopted parents, Ernest "Ernie" and Ruby Lundsford Moore, several aunts and uncles and cousins; Grandparents, Cora Odum Stephens, Johnny Stephens and Jim Odum, Sr.; Great grandparents, Hugh and Myrtle Lunsford and Oscar and Nancy Odum. Grandchildren; Christian Annette Scruggs, Chellie Pilkey Cullen, Matthew Ray Pilkey, Brian Scott Pilkey and great-grandchild, Bufford Jackson, and nephews Avery. Special thanks to her Beloved Caregivers; Diane Shelton, and Christy Eaton and loving neighbors. Loving thank you to special cousins Cathy Jo Yarborough, and the Odum girls.